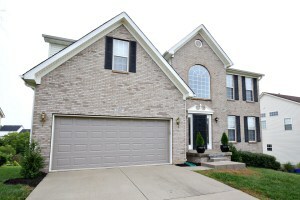 412 Lakes of Dogwood Blvd Shepherdsville KY 40165 is a beautiful 3 Bedroom cape cod on a cul-de-sac. The home has a fully fenced yard, welcoming front porch, 2 car attached garage, & security system! Enter into the lovely Great Room with glistening hardwood flooring & crown molding accent. You'll love the spacious Kitchen with hardwood floor, natural light, plentiful cabinetry, & dining area. The Master Bedroom is conveniently positioned on the first floor with Master Bath. The Laundry Room completes the first floor. On the second floor you'll find two more bedrooms, a Full Bath, and a bonus room. One of the Bedrooms showcases a window seat- the perfect reading nook! You'll also love the additional living area provided by the Bonus Room. The space would be fantastic for a playroom, home office, excercise room, or entertainment space. 412 Lakes of Dogwood Blvd Shepherdsville KY 40165 has a terrific back yard with patio, deck, grassy yard, and storage shed! The neighborhood is peaceful and relaxing with sidewalks, a playground, and quick expressway access! Call today to speak with us about Shepherdsville KY homes for sale or to learn more about this wonderful home! 502-371-1173. Join At Home in Louisville Real Estate Group this Sunday for another great Open House in Louisville! 412 Lakes of Dogwood Blvd is a beautiful Cape Cod on a Cul-de-sac lot in Shepherdsville. You'll love the spacious interior with three bedrooms, 2 full baths, and a bonus room! Great fenced yard with a storage shed, welcoming front porch, and 2 car garage! Visit us this Sunday, call 502-371-1173 to speak with us, or visit 412 Lakes of Dogwood Blvd to view additional property features. At Home in Louisville Real Estate Group will be hosting an Open House this Sunday September 21st from 2-4pm at this lovely 4 Bedroom home on a cul-de-sac lot in the Hills of Beckley Station! You'll love the spacious interior and sparkling hardwood flooring throughout the first level. Large back yard with a deck & 2 car garage. Click the photo below for additional property information or call 502-371-1173 and we will be glad to speak with you or even set up a private showing of this pristine home in Louisville! Join At Home In Louisville Real Estate Group this Sunday September 14th for an Open House at 8916 Westport Rd. You'll love this updated four bedroom home with neutral decor. Call 502-371-1173 to speak with one of our agents about this home. We welcome you to explore our website or visit Open houses in Louisville for a comprehensive list of all area open houses this weekend! I love selling the city of Louisville to excited future homeowners. What could top that? Eating at a Louisville original restaurant can. There is nothing quite like a meal created by a chef that lives right in your very own city. 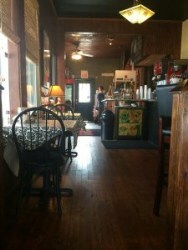 My husband and I were on Frankfort Ave this week when we saw a quaint little restaurant properly titled Crave Café. I say properly titled because I have been craving it ever since we left. As we walked up to the small, cozy café, we were greeted with the words “homemade” and “finest meats”. It seemed like a great start. The restaurant itself was an adorable chic and rustic theme that satisfied my personal taste. The staff was very friendly with good ole southern mannerisms. After getting recommendations from the waitress, my husband and I ordered our food. We chose to sit outside and enjoy the fall weather – because soup must be eaten with a fall breeze. One of the Crave Cafe soup specials of the day was chicken tortilla, so we started off with a bowl. It was a great temperature and very flavorful. 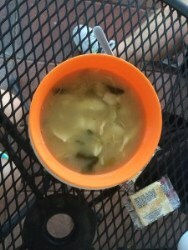 I was very hungry when we arrived so having warm soup ready to eat was satisfying. 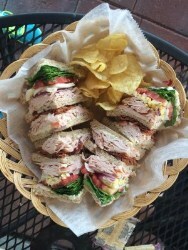 My husband ordered the Kentucky Cobb sandwich. My favorite part of this sandwich was the addition of boiled eggs. I have not had this on a club before and it was delicious. The blue cheese mayo was a tasty touch as well. His sandwich was so large that we shared it and still had some left over. I ordered the Joe’s Special and have not stopped craving it since. I contemplated ordering a second sandwich before I had even finished eating. I have eaten many grilled chicken sandwiches in my life but this one is my absolute favorite. Note that I did swap out their honey mustard for mayo on my sandwich. 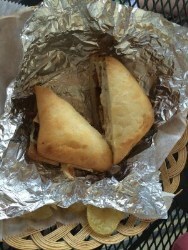 Between the applewood bacon, ciabatta bread, and melted Swiss cheese, I was in sandwich Heaven. I’m already planning my next visit to Crave Cafe. I encourage you to stop by as well and support a delicious, local restaurant. Let me know what you think! For more details about Louisville dining options and the unique offerings of our city or to speak with someone about Louisville Real Estate, Call our team today at 502-371-1173. 7901 Kenhurst Dr Louisville KY 40258 is a bright well maintained three bedroom home in Louisville! You'll love the landscaped entry which leads to a neutral Living Room with abundant natural light. The Kitchen displays plentiful cabinetry, access to the back deck, and comfortable dining area. The good sized Master Bedroom has a walk in closet. There are also two additional Bedrooms, an updated Full Bath, and Laundry Room. 7901 Kenhurst Dr Louisville KY 40258 has a fantastic back yard with a large grassy area for outdoor games, relaxing deck, storage shed, and above ground pool! The deck was added just three years ago. Both the front and rear doors are new as well as the front screen door. New entryway flooring & fresh paint in the bedrooms! Call 502-371-1173 today for additional information about this great home in Louisville!